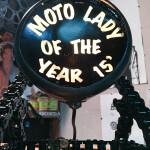 Last year at the Quality Control helmet show celebrating four years of MotoLady, I awarded Sofi Tsingos with the title of “MotoLady of the Year” for 2014. 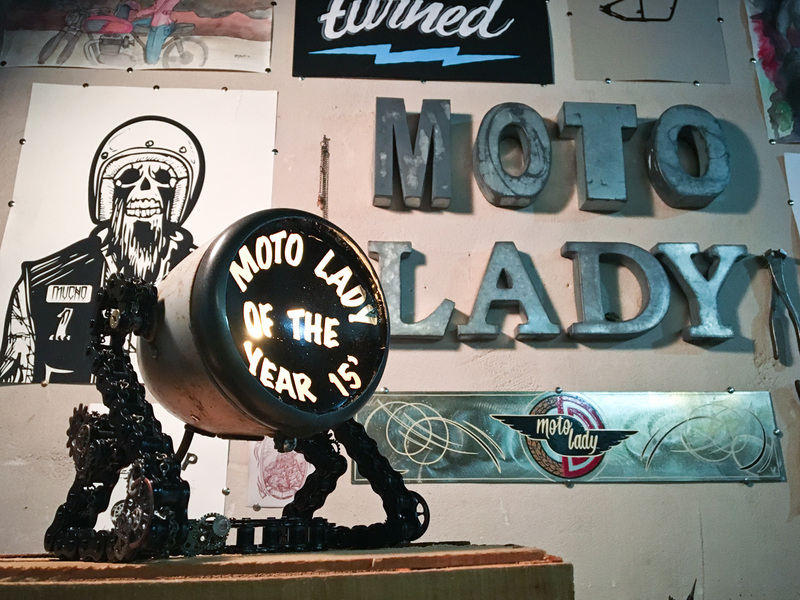 Sofi passes the torch to Shasta Smith with a hand made custom trophy that also doubles as a lamp made out of a chain and vintage Ducati headlight. 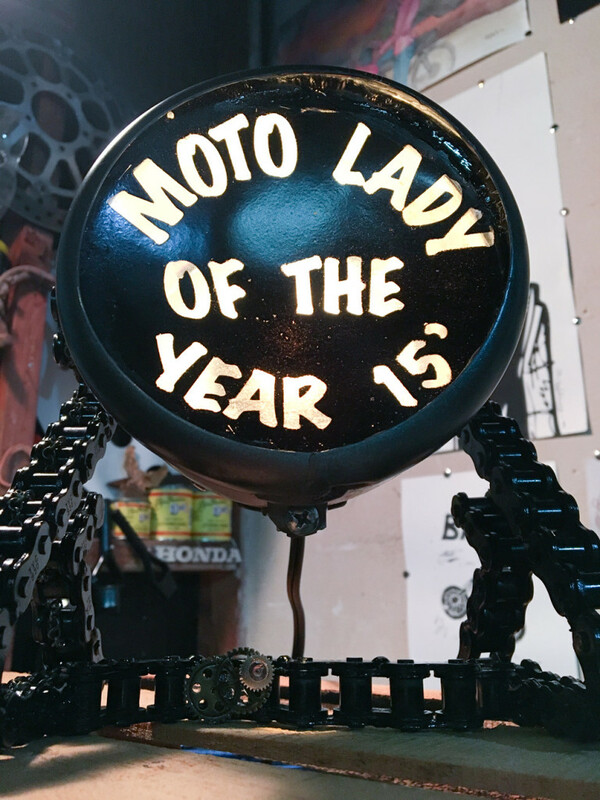 The tradition continues- motorcycling woman and builder Shasta Smith earns the title MotoLady of the Year 2015 by doing good for her local community, and motorcycling as well. Shasta runs (and founded) the Vintage Monkey garage in Northern California. 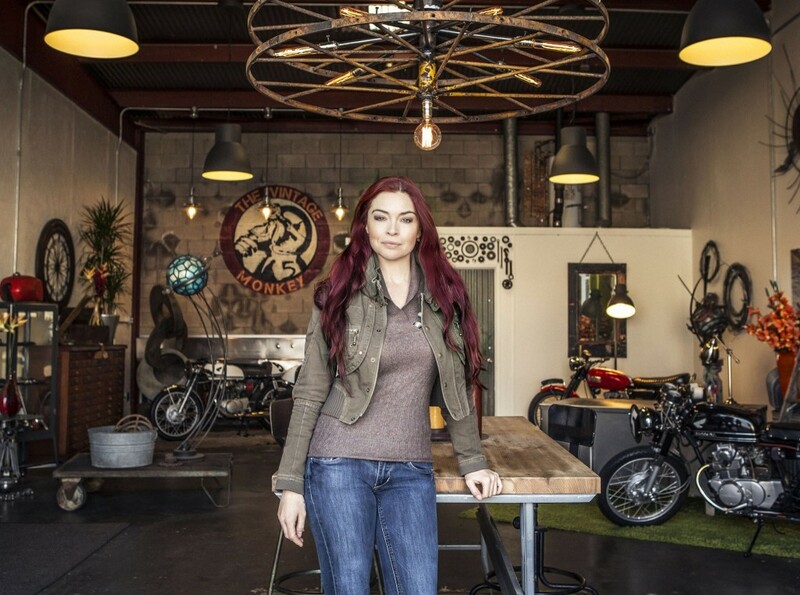 Through her shop she builds and restores motorcycles for charity, creates unique decor pieces, and hosts a TV show called ‘Red Hot Design’. 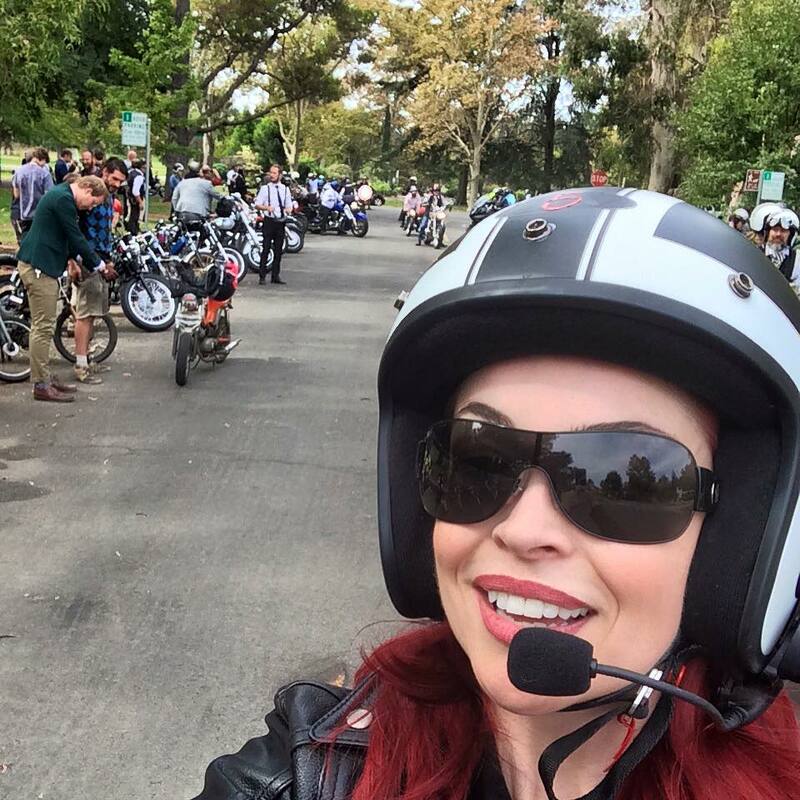 Q: How long have you been riding motorcycles? A: I’ve been riding for 23 years, and 21 years as a licensed rider. 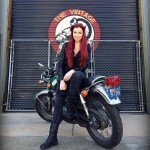 Q: When did you start the Vintage Monkey Garage, and why? A: Vintage Monkey has been in existence for almost 20 years, however Vintage Monkey has been a “public” entity for the past 10 years. Q: You do work for the greater good- what charities do you work with and how? 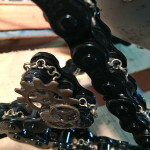 A: I don’t “sell” restorations, I only do design/builds for charity purposes. 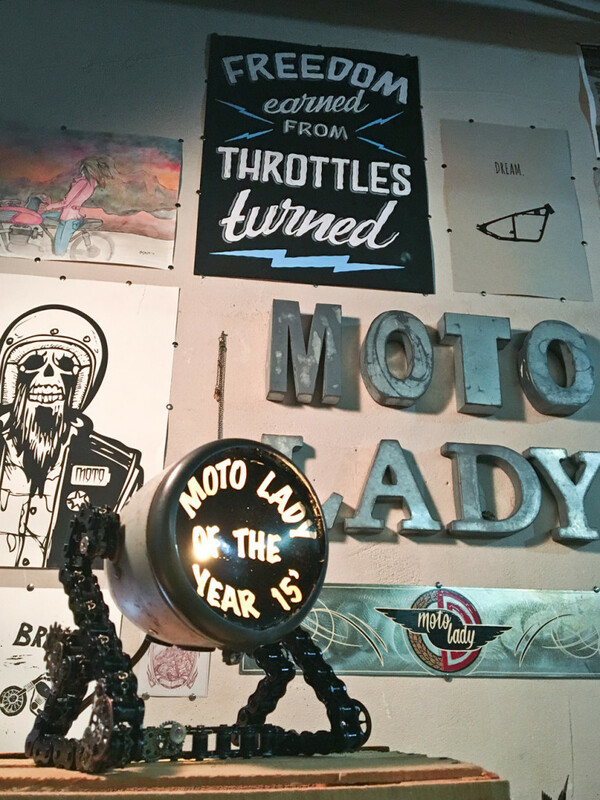 For example; the past two years I’ve designed bikes for “Sky’s the limit Fund” and the next one will go up for live auction this May 2016 at Levi Stadium in California. A 1973 CB750 race replica. 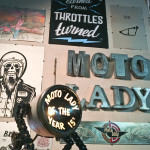 Q: How do you feel about the quickly increasing group of women riding motorcycles? A: I think it’s awesome! It was a lonely time not that long ago, and now it’s on FIRE! 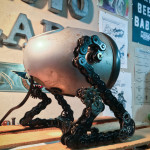 Q: What are some of your big goals for the upcoming year of the Vintage Monkey? 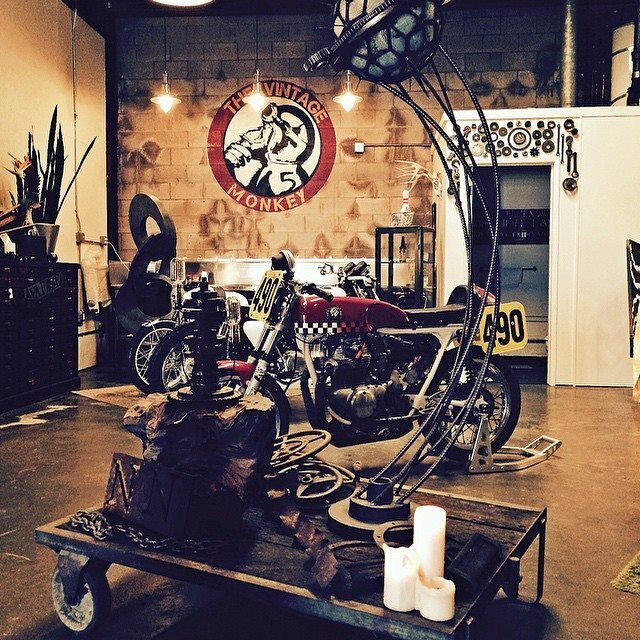 A: The 2016 benefit bike will be finished up and go to auction, after wrapping up my TV series Red Hot Design, I’m continuing production of a new series called Motorcycle Mondays (with a spring/summer 2016 launch) and also finalizing a multi-phase plan for the Vintage Monkey restaurant/retail. I come from a long line of hard workers and I strive to keep that ethic alive! Q: You’ve been dealing with some personal battles and medical issues. Do you mind telling us a little about that? Are motorcycles helping you through? A: I rarely talk about it, but I have and immune disorder I was born with that causes all kinds of pain and problems, and also underwent major surgery not that long ago for cancer… Pretty boring stuff, right? I’m human, I come with a few flaws, but I love work and it’s what keeps me centered. I have a 17 year old son, so I’ve got a lot to live for. 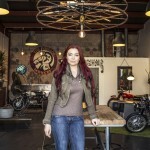 Q: Do you have any hopes for the motorcycle industry and community in the near future? 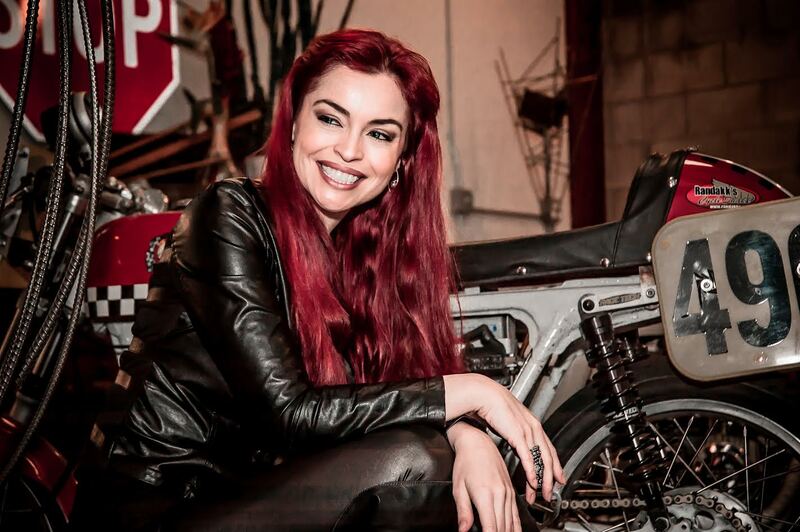 A: Motorcyclists has always been viewed as a “family”, families don’t always get along 100% of the time, however my hope (with the age of the internet) is that we will combat cyber bullying. Our motorcycle brothers and sisters should always have each other’s backs. Stop sharing putdowns and start sharing a beer. Period. 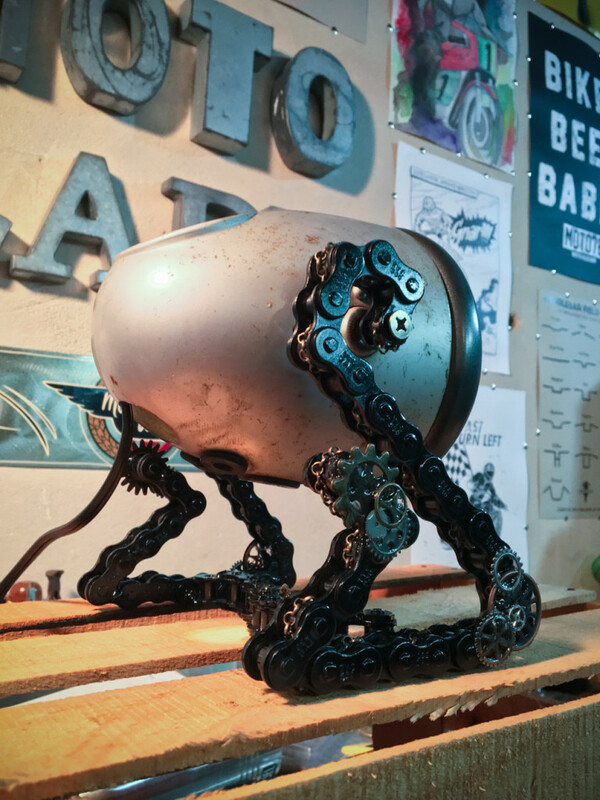 Here’s a closer look at the trophy made from a Ducati headlight by Sofi Tsingos at GT Moto. 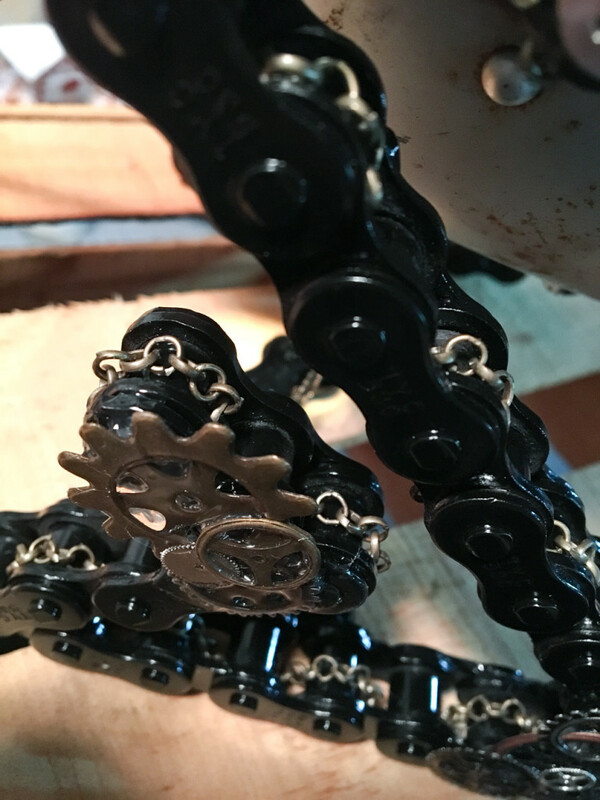 Don’t miss daily shop talk on the Vintage Monkey facebook page, more of her work on the website, and behind the scenes goodness on instagram! Um, so the Honda RC-51 is a fun bike… no surprise there eh?